Thanks for sharing your feedback, James. We're so glad you're satisfied with your purchase. Cheers! Good drop in quad rail, fit snug on my armalite M15, no noticable play or movement but I'm not mounting optics on it regardless. Will soon be adding a VFG and maybe a bipod. One of the best quad rails for the price. Was installed in 5 minutes. No rattle and looks Great! Only down side is no heat shield and will add some weight to your AR15. 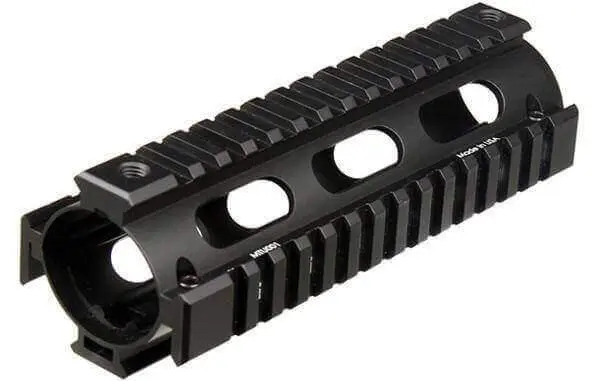 This is a very nice quad rail...fits the Ruger AR 556. I purchased this rail, 45 degree irons and a magpul handle. I have a Bushmaster 223 556 ar15. These items not only fit perfectly but only took 15 mins to install. Great products! !